The Rolling Stones' 1967 move into psychedelic rock Their Satanic Majesties Request returns on vinyl for Record Store Day 2018. Featuring string arrangements by John Paul Jones, Mellotron and various other keyboard textures and effects, African rhythms and elaborate vocal harmonies, Their Satanic Majesties Request remains over half a century later unlike any other album in the Stones' discography. Recorded at London's legendary Olympic Studios during the heady days of the ‘Summer of Love,' in a landscape of fervent creativity — Pet Sounds, Sgt. 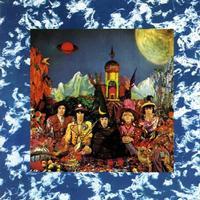 Pepper, Hendrix, the Velvet Underground, and the Who — Satanic Majesties stands out as a dramatic landmark.